A new event is coming to the Vauxhall Public Library next week that hopes to see the community get involved. 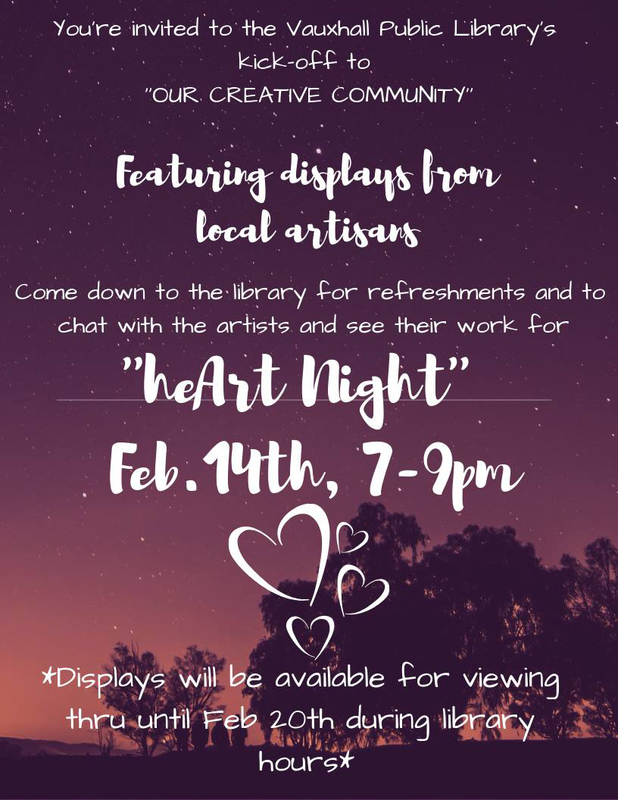 On Feb. 14 from 7 to 9 p.m. at the Vauxhall Public Library, they are hosting heArt Night displaying art from local artisans. The event will also provide refreshments for all in attendance with some Valentine-themed goods too. While the event is only held for one evening, the hope is to have the art displayed at the event stay for viewing for the next several days as well. “We are also going to serve coffee and juice and Valentine cookies and chocolates in keeping with the Valentine’s theme. We are going to allow as many as the artists who would like to, to keep their art displayed in the library for the week,” explained Norris. Artists who will be featured at the event include Jennifer Stuckey, Petra Klempnauer, Angie Klemen, Kathleen Klemen, Lyn Unser, Pat Coad and possibly two more unconfirmed guests. Norris added they could only fit so many pieces of art due to space though they hope to include more artisans later on. On top of some local art to view, it was also a good chance to show off the new and improved Vauxhall Public Library. “We are inviting the public to come in and meet our guests and to view all of the art that is being made locally. It is also an opportunity for people to come in and see the library if they haven’t seen it before,” added Norris. With heArt Night being the first feature event for the library, they have plans for future events of the same nature. Before heading further down that path though, they are waiting to see how the community reacts to the first event.